Depends how much you're willing to spend, in part. My advice would probably be to reposition away from Heathrow. 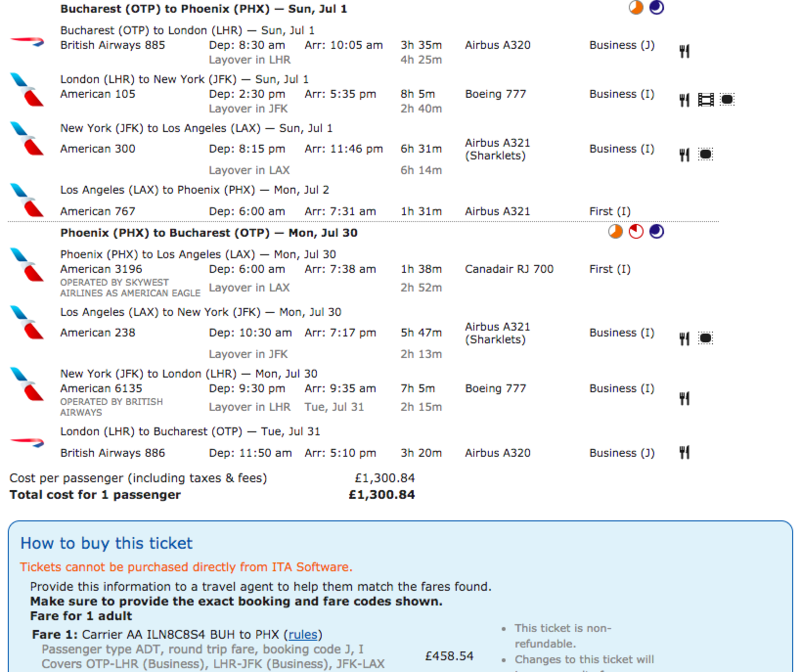 Something like BUD-LHR-JFK-LAX-LAS (then drive back to LAX, or fly if you want) in business is around £1580 (and 720TP). There's also good premium economy offers on ARN/OSL-LHR-LAX (think it can be re-routed via JFK, can't remember) for around £700. Won't yield the same TP as above by a long stretch though (maybe 220TP). There was a JER-PDX in business (680TP, but I'm not sure if it's still around, worth exploring (JER-LHR-JFK-LAX-PDX-LAX-JFK-LHR (no JER completion, otherwise it ups the cost)). A number of options anyway, that'll put you in a position to drive/fly back to LA and nest in flights accordingly to have a rewarding and comfortable flight(s) for a relative bargain. Thanks for this - very helpful. With ITA, am I just plugging in random options (within the guidance given above) to try and find something? I've been searching and not that much compelling is coming up so I'm curious if I'm missing a trick here. Give me some dates and a budget I'll have a look. DM box also open. greenmeadie and dycc like this. Thank you mmxbreaks - just sent you a DM. 1. You'll need to position to Bucharest the day before and pay for overnight accommodation. Still, cheap city, that's unlikely to be a problem at a weekend. 2. The LAX arrival time means a horrid short overnight stop, so you may wish to purchase a hotel - but that'll only get you around 3hrs sleep by the time you're there. 3. Of course, there's the small fact you'll end up arriving in PHX, not LAX, the next day - so that's another cost to get back to LAX. Nonetheless, with all that said, and otherwise workable connection times, it's a relative bargain really. 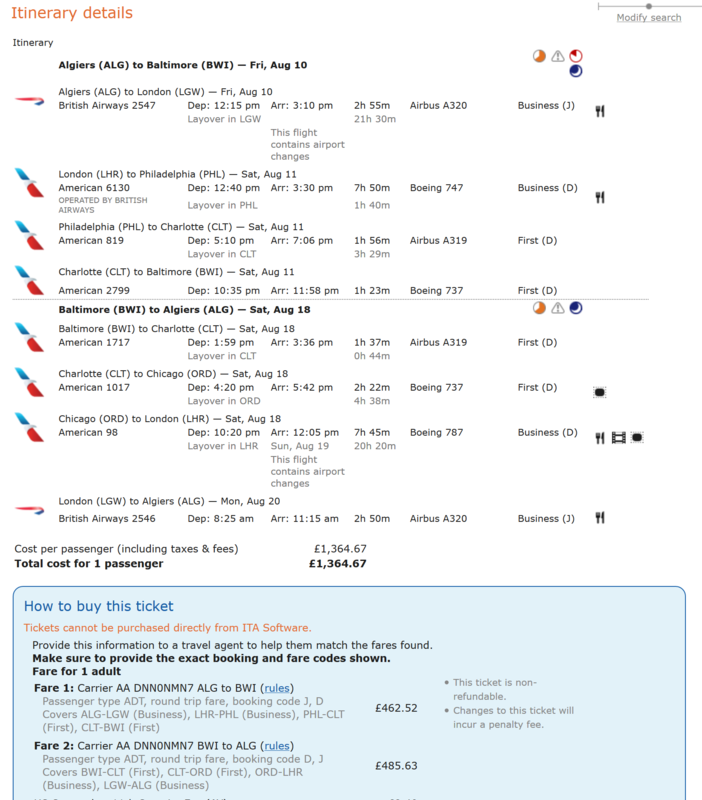 LHR-LAX direct in business is closer to £5Kpp. The above I think you could do for £1,600pp including hotels and positioning flights. Others can advise on Travel Agents that can book such an itinerary. I've used Propeller twice now and it's always worked out well, even with complex things such as this. The people there seem to understand our odd routings... Or phone the airline direct (think that price is with AA, BA is about £25 more - by which time the TA route may just be easier). Got it!!!! Thank you so much! Amazing stuff. Gonna try and get this booked today. Thanks for taking the time - this also is really helpful for future bookings. Which I believe is 80+140+40+40 *2 = 600 TP, so 2.17 £/TP. On the return I would like to fly via an AA hub and visit a flagship lounge (hence ORD). Suggestions/improvements are welcome! The dates above are approximate/can be adjusted. EDIT: I have just realised and noticed I need a visa for Algeria - maybe a good PRG routing would be a better idea. Presently having issues with ITA Matrix, so very sorry for not being able to give you examples. 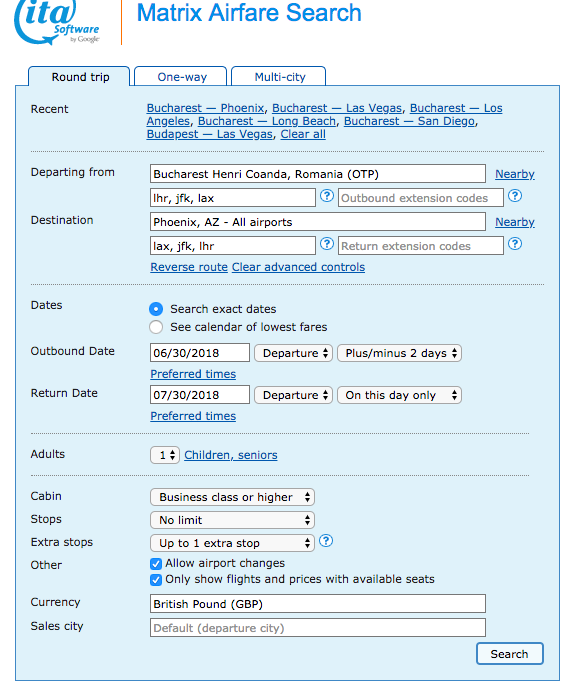 Didn't know about a ALG-BWI fare, the ALG-JFK fare, more info here is very generous, not only being fully flexible, and lower than quoted, but also with unusual routings allowed. Using this fare for Baltimore, my preference would be the LAX-JFK lie-flat transcon both ways and connect to Baltimore by air/train/car. On Friday, my trusted TA made a reservation for me flying ALG-MAD-LHR-LAX-JFK (18h) -LAX (stopover 10d) -LHR-MAD-ALG, fare £1109. As this is an ALG-JFK ticket, the stop in JFK (as also LAX) can be both longer and shorter, no min stay requirement. LAX has a newly rebuilt Flagship Lounge in T4, and in TBIT there are the QF lounges. There is a way around the Visa need - I'll be positioning to PAR. AF has a morning flight CDG-ALG, and Air Algerie (AH) , with good reviews, flies from both CDG and ORY, although the morning flight from CDG arrives 2h10 before the IB flight to MAD. Personally, when transiting in an airport unknown to me, I'd prefer more margins. Returning in the afternoon to PAR, after your final segment, you'll go TWOV on both occasions, saving time and money. This is how it becomes addictive btw. What an excellent fare - that is DNN0NMN7 correct? I just pulled it up on expert flyer, but I can't see the routing information that people talked about in the thread above. Why would I not be able to add a stopover in Baltimore? On a train presently, only equipped with my mobile. The fare code of my ticket is INNN3C, covering travel ALG-JFK. For my plans, the possibility to make a longer stopover in LAX was useful, especially when no minimum stay in JFK was required. The Premium Fare Deals thread, which I linked to in my previous post, have only elaborated on the west coast hub routing one way or both, IIRC. Adding BWI, with necessitating another transfer, like CLT, into some quick searches increased the price from +55% to +350%. If BWI is a must, there must be some limitation I can't see on the mobile, that drags the price up. Without JFK, this fare does not seem to work. Good luck in circumventing the obstacles, or maybe compromise and have a ticket to JFK (by all means, don't miss the turn-around in LAX, with/without stopover) and buy a separate ticket JFK-DCA r/t + shuttle to BWI, train NYC-WAS or a rented car JFK-BWI. This is very last minute but is there any last minute affordable mileage run deals between Europe-US from June 10 that anyone knows about? Thanking you in advance. Are the LAX-PTY or similar runs still going? Haven't done one for a while so started looking at one in Oct. Can only seem to get a 6am departure from LAX before the prices jumps from £852 to £3k+. Tried AA.com but that gives me proxy errors on anything more complex than a to b. Probably a website issue at present. The fare code of my ticket is INNN3C, covering travel ALG-JFK. Hmm, the allowed routing that Calchas posted at https://www.flyertalk.com/forum/showpost.php?p=29579702&postcount=66 does seem to suggest that routing via WAS is OK. I think I just need to find a decent TA (hint, hint, tell me!) that could actually price this itinerary up for me. I class availability is good for the dates I want.